Anyway, on this cold winter’s day, I felt like something simple and soothing. I wasn’t feeling too great the night before with an upset tummy so I wanted something soupy. I thought I’d make some dumpling soup. I had mince meat in my fridge that is threatening to go bad if I don’t use it soon enough so today’s the day! I also made a vegetarian version too, because my partner is a vegetarian. And it tastes really good too, acccording to him. The soup base is made out of carrots, daikon radish, chinese cabbage, onions, 1 tablespoon of wolfberries or keichi in chinese, 5 dried red dates, 1 aniseed, 1 teaspoon of szechuan peppercorns (or black/white peppercorns), 1 inch knob of ginger, salt & pepper. No meat or bones but with the veges, esp the chinese cabbage, it is enough to “sweeten” the soup into a clear, tasty and healthy broth. I top the soup off with a bit of fried garlic bits and oil so that it rounds up the flavor into a very fragrant soup for later. And to make an otherwise simple recipe, well, simple, i had to make my own dumpling skin. I didn’t have any dumpling skin at hand. And since i had flour and eggs, I thought i might as well make some skins myself. Anyway, feel free to use pre-made dumpling skin if you’d like. You can get wanton skin too if you’d like your dumpling to have a wanton-y, silky feel to it. 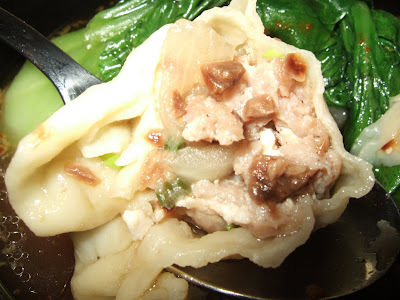 Read this to know the difference between wanton and dumplings. Mix all the ingredients together and let it sit in the fridge for an hour or until you’re ready to useit. Mix everything together and store until ready to use. To make the dumpling, just fill them in and pinch to close all ends. I just use wonton style cos they’re easier – as you can see in the picture above. And here’s how it looks after i take my first tantalizing bite! This is an very clean sort of comfort food that’s easy on your digestive system when you’re under the weather. You can add a bit of veggies to it too – i added baby Bok Choy to it. Looks good! Have been taking all the fried and hot stuff and i think its time to hv some lite n comfort food! Thx for sharing!